the winners of the New Belgium Brewery's "What's your Folly?" contest after writing a jingle for the brewery. 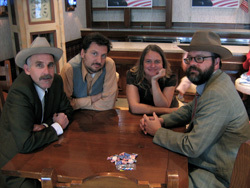 Sweet Sunny South represents the traditional music of greats such as The Stanley Brothers and The Carter Family at the same time drawing influences from more contemporary bands such as The Freighthoppers, The Wilders and The Reeltime Travelers. Banjo and mandolin player, Bill Powers, writes most of the bands’ songs, which take the listener on scenic journeys into dusty old American music. Cory Obert plays a mean old-time fiddle, sometimes with a Cajun flare and sings a solid high tenor. Rob Miller also writes songs, plays the D-28 and sings lead and harmony. Shelley Gray (a.k.a. “Laura Ingalls Wilder-n-Swingin”) plays the ‘ol kay Bass, sings, hollers, and puts the "Sweet" in Sweet Sunny South. Audiences can expect a highly entertaining stage show featuring rollicking fiddle tunes, soulful ballads, tight vocal harmonies and an exceptional array of original songs combined with a heavy dose of humor that keeps the crowd smiling. They have recorded 4 unique and entertaining CDs which are receiving heavy airplay across the country. Transport yourself back to the glory days of the Grand Ole Opry and experience Sweet Sunny South dressed to a "T", weaving in and out around a single microphone presenting their style of old time music you wont soon forget! 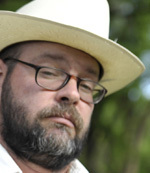 As the main songwriter in the group, Bill draws from his Mississippi upbringing. Although he grew up around a variety of music, he didn’t start playing the guitar until college. He was originally inspired by Jerry Garcia and playing Grateful Dead songs with his friends at UT, Austin. After moving to Colorado, music became a bigger part of Bill’s life and resulted in a variety of bands including rock-n-roll, world-beat and finally, bluegrass. It was around this time that Bill picked up a mandolin and Sweet Sunny South was born. Bill’s unique style of songwriting helped shape the band and the addition of his plectrum banjo adds to the bands unique sound. Rob, the other songwriter in the group was born in New York and brought up on backseat country music. He began playing the guitar around the time he was introduced to the jazzy style of David Grisman at Bill Grahm’s Music Festival in 1991. He eventually returned to his country roots listening to and learning from Hank Williams, Bill Monroe, Stanley Brothers, Johnson Mountain Boys and later The Reeltime Travelers who brought the real “old-time” music to light. Shortly after Sweet Sunny South dove head first into old-time music and Rob dove head first into songwriting, contributing a handful of new songs to the bands repertoire. Since leaving home in 1987 Rob has lived in New York, Colorado, New Mexico and California. He now lives in Paonia, Colorado with his wife Rebecca and their 2 little girls, Sadie and Kayla. A few years ago they started Pickin’ Productions where they bring national and regional bands to Paonia as well as producing 2 summer concert series in Ridgway and Paonia, CO. When he’s not raising little girls or irrigating his farm, he’s busy acting as the booking agent for a handful of the best bluegrass outfits around the west. Check out www.pickinproductions.com for more info on the concerts and bands.